The purpose of the DATCOM (Data Compendium) is to provide a systematic summary of methods for estimating basic stability and control derivatives. The DATCOM is organized in such a way that it is self-sufficient. For any given flight condition and configuration the complete set of derivatives can be determined without resort to outside information. 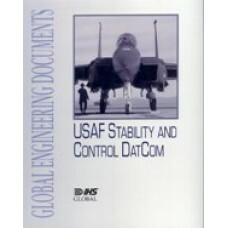 The book is intended to be used for preliminary design purposes before the acquisition of test data. The use of reliable test data in lieu of the DATCOM is always recommended. However, there are many cases where the DATCOM can be used to advantage in conjunction with test data. For instance, if the lift-curve slope of a wing-body combination is desired, the DATCOM recommends that the lift-curve slopes of the isolated wing and body, respectively, be estimated by methods presented and that appropriate wing-body interference factors (also presented) be applied. If wing-alone test data are available, it is obvious that these test data should be substituted in place of the estimated wing-alone characteristics in determining the lift-curve slope of the combination. Also, if test data are available on a configuration similar to a given configuration, the characteristics of the similar configuration can be corrected to those for the given configuration by judiciously using the DATCOM material.